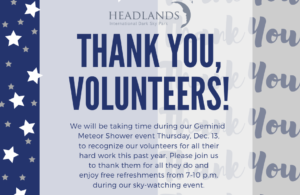 Emmet County Parks & Recreation officials will be taking time during our Geminid Meteor Shower event Thursday, Dec. 13, to recognize our volunteers for their dedication and hard work this past year. Please join us to thank them for all their contributions in the continued success of the Headlands International Dark Sky Park. The night kicks off with a presentation at 7 p.m. by Rod Cortright from Northern Michigan Astronomy Club (NOMAC) on the 3200 Phaethon “Rock Comet” that is the parent body of the Geminids meteor shower which approaches Earth in mid-December. 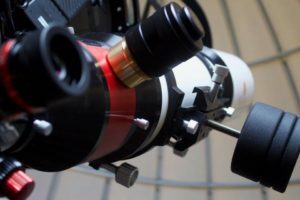 Weather-permitting, telescopes will be brought out on the viewing platform for stargazing from 8-10 p.m. Astronomers will be on hand to guide visitors as they turn their eyes to the skies. Admission is $10 per person with free refreshments provided from 7-10 p.m. Celebrate the Solstice by bringing light and rhythm into the dark stillness of the season. Listen as musicians entertain, learn about the solstice night sky, and craft a hand rolled beeswax candle. Real-time remote observatory telescope viewing from main level big screen monitors. Professional star gazers and astronomers on site to enhance your viewing experience. If you wish, bring your own binoculars or telescope to see more. $10.00 per night preferred parking fee.